The Tecno Pouvoir 1 is the first in a series of battery-focused smartphones recently launched, albeit quietly, by Tecno Mobile. Pouvoir is the French word for Power, which means the smartphones in this series will pack enough power to satisfy the daily smartphone needs of consumers in regions where epileptic power supply is the norm. 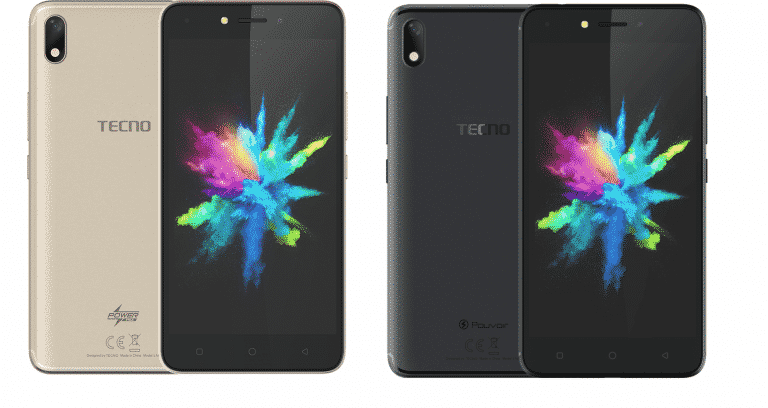 The Tecno Pouvoir 1 already has a successor, the Tecno Pouvoir 2 released recently into the market. The highlights of the device include a monstrous 5,000mAh battery that can get you going for up to two days, and a dedicated hardware button that can be used to perform different functions. The only thing missing here is a fingerprint scanner. The Tecno Pouvoir 1 comes with a 5.5-inch IPS LCD display which has an HD (720 * 1,280) pixel resolution and 18:9 aspect ratio, like most smartphones launched by the OEM in recent times, although it's not as bezel-less as the Tecno Camon X. The phone bears a resemblance to the Tecno Camon X and uses capacitive buttons for navigation. Its thickness of 8.8 millimetres is reasonable when you consider its large battery size. The Tecno Pouvoir 1 is powered by a MediaTek MT6580 processor which runs on four cores (quad-core) and at a maximum speed of 1.3GHz, and is assisted in terms of graphics processing by a Mali-400 MP GPU. The smartphone comes with 1GB of RAM for multi-tasking and has 16GB of onboard storage which can be expanded up to 32GB with the use of an external microSD card. The Tecno Pouvoir 1 packs a 5,000mAh battery that guarantees a usage time of up to two days on heavy use, and even more than that with monitored use. It doesn't come with fast charging, however, meaning you'll have to wait a long while to get it from 0 to 100%. The smartphone sports an 8MP camera with dual-LED flash and autofocus on the rear, while a 5MP camera at the front produces selfies, brightened with the aid of a LED flash present beside it. The Pouvoir 1 runs on Android 7.0 Nougat out of the box with Tecno's HiOS layered on top for extra software features. It comes with a dual Nano SIM slot but doesn't support 4G LTE network connectivity. 5.5-inch IPS LCD display with HD (720 * 1280) pixel resolution & 18:9 aspect ratio. Dimensions - 154.5 * 77.2 * 8.8 mm. 1.3GHz Quad-core MediaTek MT6580 Processor. 8MP Rear Camera with Autofocus and Dual-tone LED Flash. The Tecno Pouvoir 1 costs $129 (around N40,000) and will be made available soon in Nigeria.